Istanbul takes its name from the Ottoman city (formerly known as Constantinople) where the first mechanical alarm clock capable of striking an alarm at any time specified by the user was invented (by Taqi al-Din in 1559). Istanbul is a simple alarm clock but with additional subdials to more precisely set the alarm time. The main dial shows the time of day as usual. The large subdial shows the alarm time. 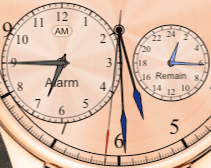 The small subdial (labeled "Remain") shows the interval until the alarm time (ie. the difference between the other two dials). To set the alarm time, pull the crown to enter set mode, then either drag the alarm dial hands to set the target time, or use the two additional pushers which will appear on the left in set mode: the upper one adds one hour to the target time, the lower one adds one minute. The alarm time cannot be more than 24 hours in the future; note the am/pm indicator beneath the 12 on the alarm dial. The pusher on the right side enables the audible sound; it is always available. The indicator beneath the 12 shows a musical note if the alarm sound is enabled or blank if not. The sound is disabled by default but is enabled automatically when entering set mode. There is no start/stop; the clock is always running. When the target time arrives, the alarm will sound (if it is enabled) and the indicator will animate. It will ring 20 times (about 10 seconds) or until canceled. When the alarm is ringing, you can silence it by tapping anywhere on the screen or by shaking the device (note: shaking will not work if the iPhone is locked). If the iPhone's hardware Ring/Silent switch is set to silent mode, Emerald Chronometer's alarm will follow the "Sounds => Silent" setting in the Settings app, either vibrating or doing nothing. 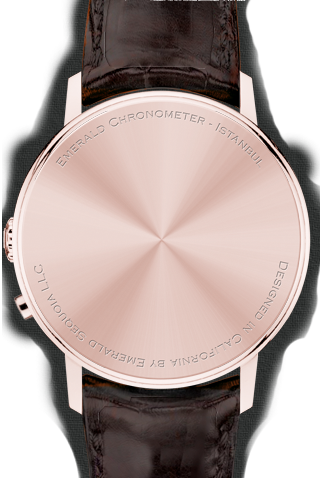 If you have Vibrate turned on for "Ring" in that same Settings section, then Emerald Chronometer's alarm will both ring and vibrate. Note that Istanbul and Thebes are functionally very similar; they both sound an alarm when a target time is reached. The difference is in emphasis: Istanbul focuses on the target time whereas Thebes focuses on the interval. For example, Istanbul's pushers go to even minute boundaries of the target time, whereas Thebes' minute pusher goes to even multiples of interval minutes. There are also subtle differences in the way that time synchronization is handled, to preserve the most accurate interval measurements in Thebes. It is not possible to adjust the main time on this watch. If Emerald Chronometer is not running when the target time is reached, and the OS supports it, a local notification popup will be posted (which may play a sound). However, we do not maintain NTP synchronization while in the background (to save battery energy) so the notification may be appear a few seconds early or late. 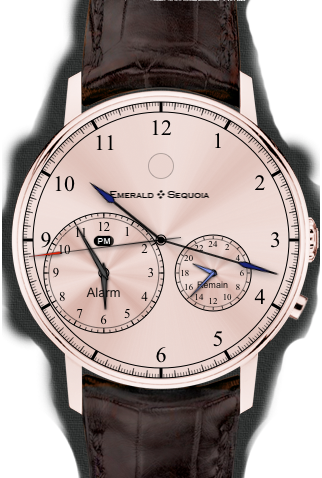 The alarm will ring if the screen is locked while Emerald Chronometer is running. Unlocking the screen while the alarm is ringing will silence it.